Pdx-1 and Irs-1, genes highly associated with diabetes onset, were knocked down in mouse embryonic stem (ES) cells in order to develop cell line models for diabetes. ES cells with different gene knockdown levels were induced to differentiate to the stage of insulin production. Among the cell lines that differentiated, we identified two in which the levels of expression of both genes were 20–40 % of that of control cells. These cell lines showed appreciable deficiencies in three characteristic malfunctions associated with diabetes, namely, insulin production, insulin reception signaling, and glucose-stimulated insulin secretion. These dysfunctions were consistent with results reported elsewhere from in vivo and in vitro studies. Both cell lines did not show any abnormal morphology such as size, shape, color, and surface roughness. No abnormal expression profiles for 17 genes relevant to diabetes were observed. Therefore, these cell lines fulfilled the criteria for a validated cell model for diabetes. The model cell lines developed here are promising biomaterials for cell-based screening tests of new medicines that may be effective in treating diabetes. We thank Dr. Niwa for the donation of feeder free EB3 cells. 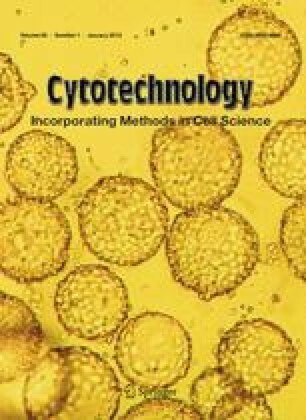 This work was partially funded by a grant to H. Matsuoka from CREST of Japan Science and Technology Agency on the research subject: The High Throughput Creation of Disease Model Cells and the Analysis of Their Function. The work was also supported in part by the Strategic Research Promotion Program, the Ministry of Education, Culture, Sports, Science, and Technology, on the research subject “Development of Next Generation Bioresources”.